Serengeti National Park is a UNESCO World Heritage Site located in Tanzania—and an ideal honeymoon destination for those looking for a unique experience. A honeymoon in Serengeti National Park will be most enjoyable if you and your partner both love spending tons of time outside. The geography of the area is beautiful and ideally explored alongside experienced guides and tours. There are often few facilities, so planning is required to make the most of the visit. 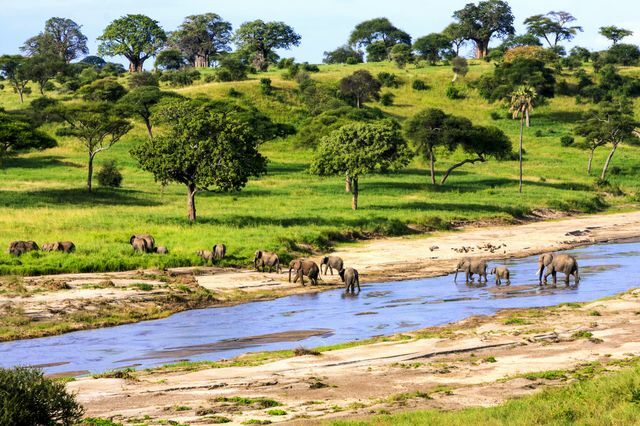 The park is famous for the mass migration of over a million wildebeest, zebras, and gazelles in search of food. Visit from December to June to catch various stages of the migration. There are various camps set up throughout Serengeti National Park during these months to accommodate the viewing of these animals. If wildlife and nature photography is your thing, Serengeti National Park is perfect for you. There are countless opportunities to snap gorgeous shots of wildebeest, zebras, cheetahs, among others. Start planning your Serengeti National Park honeymoon with the help of this guide. The best time to visit Serengeti National Park really depends on what you want to see. June to September offers the most diverse wildlife viewing experience, but there are opportunities throughout the year. Avoid the rainy season from November to May. The Great Migration: Perhaps the most popular activity for Tanzanian honeymooners. Photography: The vast number of animals provides ample opportunities for compelling and rich photography. Local Markets: Though not found in the National Park, there are villages in the area that offer handmade works of art and crafts. Hot Air Balloon Rides: Take your honeymoon airborne for a different kind of safari. Serengeti Hippo Pool: Spend some times with countless hippos at this spot. Safaris: Take a guided tour through the hidden gems of Serengeti National Park. Seronera: This area of the park is home to an especially dense population of big cats! Lobo Valley: Located in the Northern Serengeti, this area is home to lions, cheetahs, leopards, giraffes, and elephants. Game Drives: Tours centered around seeing as much wildlife as possible. Night Tours: Go on a stunning tour during the night to catch a glimpse of the universe. Camping: Nearly all visitors opt to camp in tents in Serengeti National Park. Serengeti Visitor Center: Learn more about the expansive National Park at their comprehensive visitor center.